Definition at line 47 of file CCopasiDataModel.h. Definition at line 573 of file CCopasiVector.h. Definition at line 572 of file CCopasiVector.h. Definition at line 571 of file CCopasiVector.h. Definition at line 582 of file CCopasiVector.h. Definition at line 595 of file CCopasiVector.h. Definition at line 603 of file CCopasiVector.h. Add a copy of the object to the end of the vector. Reimplemented from CCopasiVector< CType >. Definition at line 621 of file CCopasiVector.h. 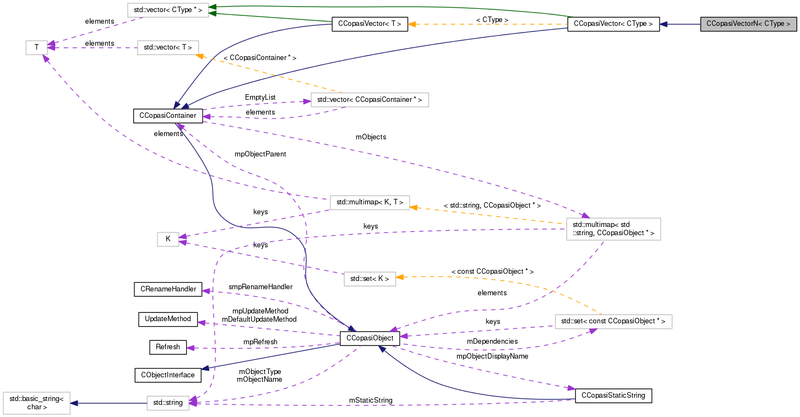 Referenced by CFunctionParameters::add(), CFunctionDB::add(), CModelAdd::addEvents(), CCompartment::addMetabolite(), CCopasiDataModel::addReport(), CCopasiDataModel::addTask(), CQReportDefinition::btnCopyReportClicked(), CQPlotSubwidget::copyPlot(), CModel::createCompartment(), CModel::createEvent(), CModel::createModelValue(), CKinFunction::createParameters(), createParameterSetsForExperiment(), CModel::createReaction(), CModelExpansion::duplicateEvent(), CCopasiXMLParser::ListOfPlotsElement::end(), CCopasiXMLParser::ListOfTasksElement::end(), CCopasiXMLParser::FunctionElement::end(), SBMLImporter::importEvent(), SEDMLImporter::importTasks(), CFunctionDB::load(), CQEventWidget1::saveToEvent(), CQParameterOverviewWidget::slotBtnCopy(), CQParameterOverviewWidget::slotBtnNew(), CQParameterOverviewWidget::slotBtnSaveAs(), CCopasiXMLParser::ModelParameterSetElement::start(), CCopasiXMLParser::ReactionElement::start(), CCopasiXMLParser::CompartmentElement::start(), CCopasiXMLParser::ModelValueElement::start(), CCopasiXMLParser::EventElement::start(), CCopasiXMLParser::AssignmentElement::start(), CCopasiXMLParser::ReportElement::start(), and test000087::test_simulate_reaction_flux_reference_1(). Add an object to the end of the vector, if adobt is true the vector. becomes the parent of the object. Definition at line 655 of file CCopasiVector.h. 664 // This is not very efficient !!! 665 // It results in a lot of resizing of the vector !!! Retrieve the index of the named object in the vector. If an object with the given name is not found C_INVALID_INDEX is returned. Definition at line 774 of file CCopasiVector.h. Referenced by CFunctionParameters::add(), CFunctionDB::addAndAdaptName(), CCopasiDataModel::addDefaultReports(), CCopasiDataModel::addDefaultTasks(), CModelAdd::addEvents(), CQReportDefinition::btnCopyReportClicked(), CFunction::completeFunctionList(), CQPlotSubwidget::copyPlot(), SBMLImporter::createCCompartmentFromCompartment(), SBMLImporter::createCMetabFromSpecies(), SBMLImporter::createCModelValueFromParameter(), CModel::createCompartment(), SBMLImporter::createCReactionFromReaction(), CCrossSectionTask::createEvent(), CModel::createEvent(), CModel::createMetabolite(), CModel::createModelValue(), CChemEqInterface::createNonExistingMetabs(), CKinFunction::createParameters(), createParameterSetsForExperiment(), CModel::createReaction(), CMetabNameInterface::doesExist(), COptProblem::elevateChildren(), CCopasiXMLParser::COPASIElement::end(), CFunctionDB::findFunction(), CCopasiXML::fixBuild55(), CCopasiXML::fixBuild81(), CMetabNameInterface::getMetabolite(), CCopasiVectorN< CReportDefinition >::getObject(), SBMLImporter::importEvent(), CCopasiVectorN< CReportDefinition >::isInsertAllowed(), CCopasiVectorN< CReportDefinition >::operator(), CCopasiVectorN< CReportDefinition >::remove(), CQEventWidget1::saveToEvent(), CQParameterOverviewWidget::slotBtnCopy(), FunctionWidget1::slotBtnNew(), ReactionsWidget1::slotNewFunction(), CCopasiXMLParser::AssignmentElement::start(), CCopasiXMLParser::ReportElement::start(), and CCopasiXMLParser::FunctionElement::start(). Retrieve a pointer to the named object. Definition at line 742 of file CCopasiVector.h. Check whether an insert of the given src into the vector is allowed to avoid naming conflicts. Definition at line 796 of file CCopasiVector.h. Referenced by CCopasiVectorN< CReportDefinition >::add(). Definition at line 610 of file CCopasiVector.h. Definition at line 694 of file CCopasiVector.h. Definition at line 702 of file CCopasiVector.h. Definition at line 710 of file CCopasiVector.h. Definition at line 726 of file CCopasiVector.h. Remove the object with the given name from the vector. Definition at line 674 of file CCopasiVector.h. Referenced by CCopasiXMLParser::COPASIElement::end(), CFunctionParameters::remove(), SBMLImporter::removeUnusedFunctions(), CModelExpansion::replaceInMetab(), CQSpeciesDetail::save(), CQEventWidget1::saveToEvent(), CQParameterOverviewWidget::slotBtnDelete(), and test000087::test_simulate_reaction_flux_reference_1().